This project is a great kid's camp craft with some adult help when using the hot glue. Just add a hanging flower or plant and you've given your flowerpot person some hair and he will never have a bad hair day! It’s quick, it’s easy and its super fun. Add a quick and easy Bowdabra bow to finish. If you use a bigger pot you can make a bigger bow and glue it to the bottom for a bow tie. 1. Download full sized pattern. Trace onto some thin cardboard to use as a guide. Trace and cut out two eyes from white fun foam, a mouth from red foam and a nose from peach or pink fun foam. 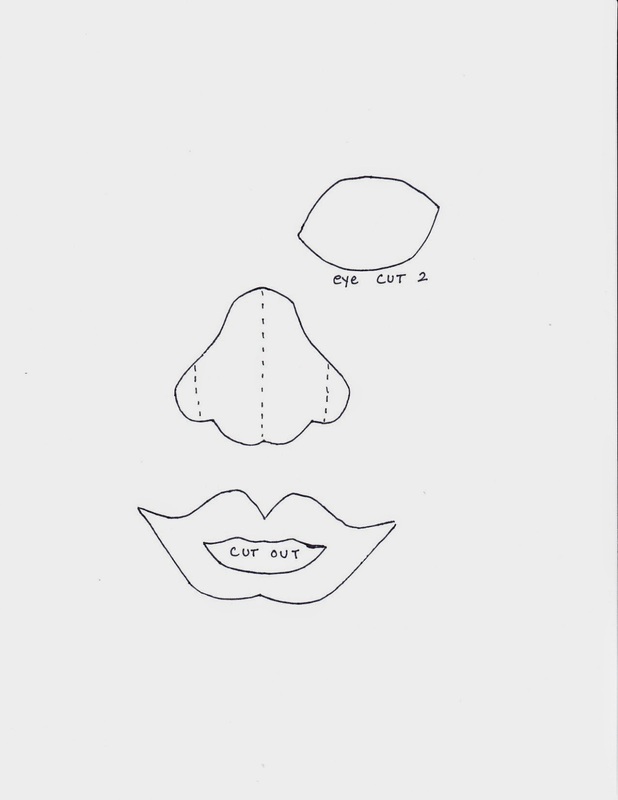 (See photo) Cut out the center area of the mouth with pointed scissors. Fold the nose foam piece in half lengthwise pressing with your fingers to make a small peak down the center. Fold the nostrils inward on each side. (This is where you will glue the nose onto the pot and the fold line down the center will make it somewhat dimensional. 3. Using the hot glue gun attach one nostril side to the center of the pot. Push the opposite side towards the first one to make it dimensional and add another bit of hot glue to attach to the pot. 5. Add some more hot glue on the bottom and under the eyelashes and attach the whites of the eyes. 6. Finish the face by adding some wiggle eyes in the center of the whites of the eyes and attaching the mouth under the nose. 7. Make the bow. Cut a 12-inch piece of Bowdabra bow wire. Fold in half and insert in the mini Bowdabra bow maker with ruler. You will have a loop on one end and two-pieces of wire on the other. 8. Using a piece of ½” or 1” wide gingham ribbon, insert in the Bowmaker to the two inch line. 9. Make a loop to the one-inch line on the other side. 10. Make a matching loop on the opposite side and end with a tail at the two-inch line. 11. Use the Bowdabra wand to scrunch down the bow. Insert the two wire ends through the loop end and pull tight. Make a knot in the back. 12. Fold the ribbon in half and cut with scissors to make two points on the tail ends. Use the hot glue gun to attach rhinestone in the center and attach to the top of the pot. Add a plant such as a spider plant or other falling leaf plant to the pot for the hair. 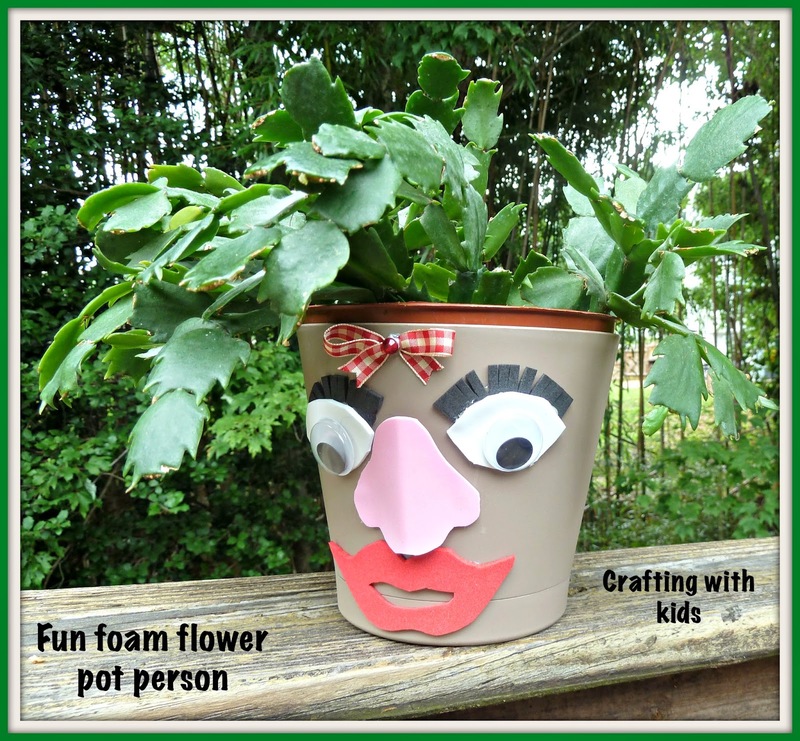 I saw the photo and just had to come over...this flower pot face is so funny! !